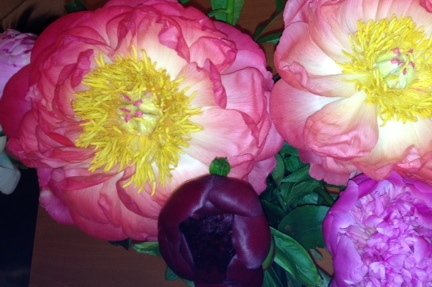 It’s the season of peonies, one of my favorite flowers. 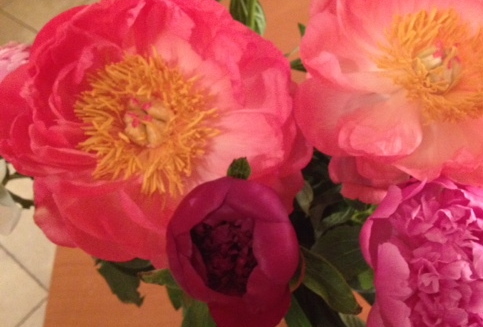 We have several peony bushes out in the garden, but a good friend brought over a bouquet yesterday that included a couple of spectacular blossoms. I tried to capture the color explosion once without a flash, and once with a flash, using my phone camera. The flowers are the same, but the flavor of each image is different. This week the fates conspired to provide me, not only with beautiful flowers, but with a variety of Balvenie whiskies. We usually have a bottle of Balvenie Doublewood 12 Year Old around, so that’s nothing unusual. Over the past week or so, we’ve been traveling, and we picked up two other bottlings in duty-free areas of the airports we passed through. We have a Balvenie Triple Cask 12 Year Old, as well as a Balvenie 21-Year-Old Portwood Finish. Last night we tried the two next to one another. We started with the oldest. The Portwood 21 Year Old is pretty special. It’s matured in traditional oak casks, then transferred to port casks for final ageing. This whisky is such a treat, and is really worth savoring. It’s very rich, has a warm but subtle hint of peat and oak, and for me, tasted of tart apple cider with honey, red berries and malt. Luscious. The Balvenie Triple Cask series has three bottlings: 12, 16 and 25 years. As far as I can tell, all three are only sold as ‘travel exclusives’, i.e. in duty-free shops. The whisky goes through three types of casks: ‘traditional refill casks’, ‘first-fill ex-Bourbon barrels’, and ‘first-fill Oloroso sherry butts’. Whatever they’re doing, they’re doing it well, because the Triple Cask 12 Year is mellow, smooth, with just a whisper of smoke, dried apricot, sherry, burnt sugar and vanilla. Maybe it wasn’t fair to try the Portwood first, because the Triple Cask tasted almost simple by comparison. But once we settled into it, the younger whisky was also a delight. And after those two whiskies, even the water tasted wonderful. A few other fine variations for Sunday.